Wait a sec - just because you see the word ska, don’t automatically assume it is crap. This is the real-deal-Holyfield here; 1st generation ska, straight from the island of Jamaica during the 1960's. 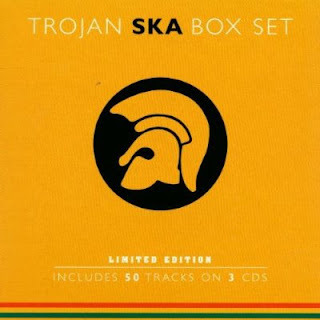 For those who don’t know, Trojan was the powerhouse label for all of reggae music back in the day, and they’ve released a series of box sets covering all kinds of sub-genres that fall under the reggae moniker - ska, rocksteady, roots, dancehall, calypso, and plenty more. Each box set contains three CDs, 50 songs, covering the original sounds of the Caribbean. The ska discs include such legendary artists as Desmond Dekker, Lee Perry, Jimmy Cliff, The Ethiopians, Lord Brynner, The Paragons, Tommy McCook & the Skatalites, and many, many more. If you’ve ever had any interest in reggae music, but wasn’t sure where to start, grab one of these Trojan Box Sets.